Nearly 10% of American roadways and area lighting have converted to more efficient LED lighting. Higher lumen packages available at far less wattage have many advantages…but lumens don't tell the entire story. There are drawbacks to poorly engineered area lighting, such as lighting trespass and glare. Common lighting mistakes can wreck havoc on an installation causing safety issues and creating a hostile environment for wildlife or surrounding properties. Cities, like Virginia Beach, are working to correct codes to ensure the safety of areas surround parking lots and roads. The U.S. Department of Energy states “To maximize energy savings potential and user satisfaction, luminaire selection, lighting controls, and installation have to be considered during the design phase and not as an afterthought.” See reference here. How do you light a parking lot for safety and efficiency without glare or lighting trespass? Good planning & engineering offers a solution! LED Optics collect light and magnify it towards the target surface. Precision optics create an even light distribution that can be distributed either to the sides, front or 360 degrees around the fixture. Lighting trespass occurs when optics fails to contain the light within the desired distribution. An excellent example of precision optics comes in the Lithonia D-Series Extreme Cut-Off with BLC Optics (results shown in featured image). The photometric below is a comparison of the D-Series fixture specified without the optics and with the cut-off optic. 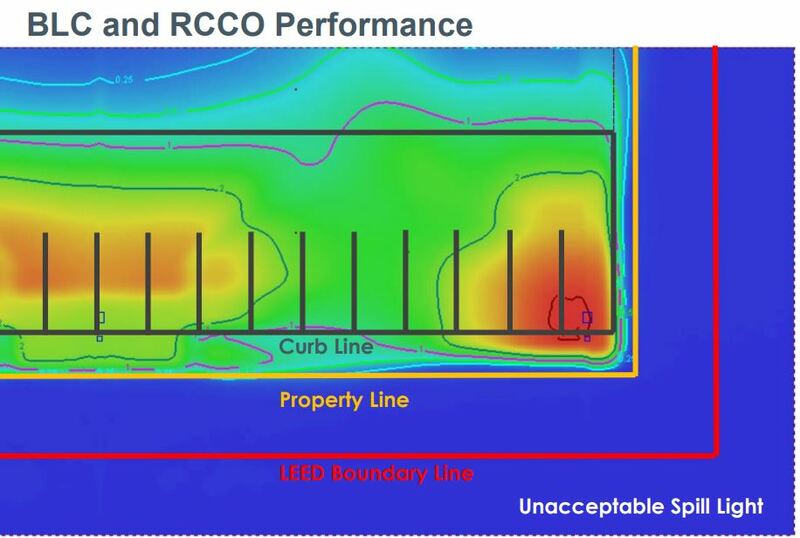 It's important to take the footcandle contour line (shown in white) into account when determining light trespass. The BLC does an exceptional job; see how the light stays within the parking lot in the photometric rendering below. Contrary to common thinking, more light isn’t necessarily better. According to the department of energy, “When an LED replaces an incumbent product, such as a high-pressure sodium streetlight, the LED can often meet the illumination requirement with only half of the total lumens of the incumbent lamp.” Dept Energy Reference Here. How is this possible? Even distribution is key to the appearance of bright light. While we often use footcandles (the intensity of light called illuminance) to express the lighting requirements of parking and street lighting, the measure of light that the eye see is luminance. Luminance, sometimes called brightness, measures light "leaving" a surface and the reflectance of the surface. Stark contrasts in reflectance create glare. Better optics reduce the intense reflection, known as glare, off a surface. Leotek, manufacturers of low glare street lighting, explain how 2-stage refractive optics reduce road glare in this article on g-rating. 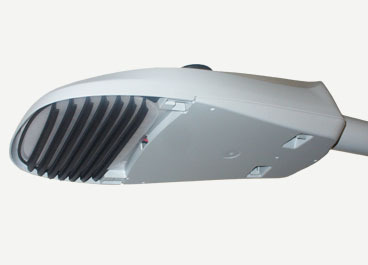 Leotek’s ComfortView™ street lights (pictured here) use this approach to address glare for neighborhood streets. Traditional first-generation LED optical systems incorporate a single optical lens over the LED; ComfortView™ incorporates a second refractor optic, reducing glare and maximizing visual comfort. LEDs controllability and dimmability means LED street lighting systems can now provide only the level of illumination needed at any given time – which is nearly impossible for conventional street lighting products. Controllability can be accomplished by in new construction and in renovation via wireless controls such Acuity Brands NLight Air. With controls, you could circuit fixtures on the site so certain luminaires can be either reduced in output or turned off during periods of inactivity. For example, luminaires along the perimeter could be reduced to direct users to park closer to the building during evening operation hours. Light levels can be reduced by switching off every other luminaire or selecting bi-level operation as a feature at the time of installation. As an example of what you can do, see this video reviewing an auto dealership parking lot using NLight Controls. Selecting low glare lighting with efficient optics is the first step. Since lighting codes differ among municipalities, a photometric study is key to determining correct light levels. The IES has created a Model Lighting Ordinance (MLO) to help municipalities determine minimum and maximum acceptable footcandles, uniformity ratios and when a BUG rating (backlight, uplight, glare) should be instituted. A good photometric study (such as pictured above) will show all components: uniformity to reduce glare, footcandles, lighting trespass. Selection of poles heights, contributing area lighting, and optics all contribute to the overall lighting result. 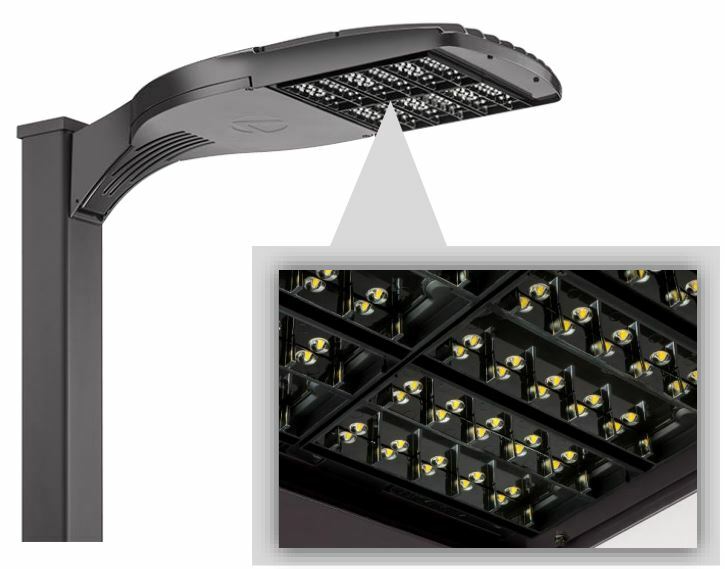 Do you need help determining the best fixtures for your parking lot or roadway lighting project? Are you planning a budget, need an ROI or assistance with photometrics? Resource Lighting + Controls is here to help. Contact us about your project today. Why Should We Be Concerned With Glare and Lighting Trespass? Our AMA supports the proper conversion to community-based Light Emitting Diode (LED) lighting, which reduces energy consumption and decreases the use of fossil fuels. Our AMA encourages minimizing and controlling blue-rich environmental lighting by using the lowest emission of blue light possible to reduce glare. Our AMA encourages the use of 3000K or lower lighting for outdoor installations such as roadways. All LED lighting should be properly shielded to minimize glare and detrimental human and environmental effects, and consideration should be given to utilize the ability of LED lighting to be dimmed for off-peak time periods.